We’d love your help. Let us know what’s wrong with this preview of Emmanuel's Dream by Laurie Ann Thompson. 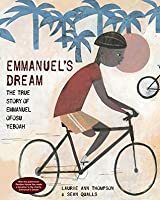 This picture book biography tells the true story of Emmanuel Ofosu Yeboah, who bicycled across Ghana--nearly 400 miles--with only one leg. With that achievement he forever changed how his country treats people with disabilities, and he shows us all that one person is enough to change the world. To ask other readers questions about Emmanuel's Dream, please sign up. What grade level would be best to read it with? Inspiring story about a boy in Ghana considered cursed for being born with a deformed leg who goes on to become an activist for the rights of disabled people. A story of humility and courage written in prose as spare and powerful as the dream itself. Simply astonishing! Go, Emmanuel! The book opens with a touching tableau--a beautiful baby boy has been born, but with only one strong leg. We can see the despair in the father's posture and the fear in the mother's eyes as she looks at the baby's father. Disabled children in Ghana were not only considered worthless-they were considered a curse, and the baby's father soon abandons the family. The mother's hope is seen in her naming the baby "Emmanuel," which means "God is with us." Emmanuel's mother refuses to allow her child to become a beggar, as was the custom for disabled people in Ghana; instead she helps him to become self-sufficient, hopping to school, two miles each way. When his classmates scorned him, he saves money to buy something no one in the school had--a real soccer ball, and earns their respect by learning to play on just one leg. When his mother falls ill, Emmanuel moves to the big city to earn money to support his family. Sadly, his mother dies, but he honors her memory by dreaming up a way to show that disabled people could do anything--a bike ride around his country--nearly 400 miles. Support for what others deemed an impossible project came all the way from America, along with the equipment he needed. We see Emmanuel riding across the country, surrounded people cheering, including disabled countrymen. Thompson concludes this inspiring story as follows: "He completed his astounding journey...in just ten days. But Emmanuel's success goes even further than that. He proved that one leg is enough to do great things--and one person is enough to change the world." Love these inspiring true stories! Emmanuel showed his country and the world that being disabled doesn't mean being unable to do anything. Imagine--he rode a bicycle across Ghana, with only one leg! I couldn't do it with two! This is a perfect readaloud for a summer Olympics year. Now I've got to dig up the documentary about this man. Highly recommended! It's important to teach our children that being different is an opportunity. This beautiful picture book does just that. Social justice efforts are incredibly worthwhile and should be an integral part of each person's life. Read this book to show younger generations that anything is possible. This inspirational picture book biography is simply and beautifully told, enhanced bold, emotional collage illustrations. Author's note includes information about Emmanuel's charity. This book starts off a sad true story but it becomes uplifting amazing story of courage and perseverance! What an inspirational person! This picture book biography of Emmanuel Ofosu Yeboah is nominated for the 2019 Monarch Award, an Illinois K-3 Readers Choice Award. Emmanuel was born with one leg that didn't work as it should, but that didn't stop him. In fact, it made him try even harder. After he became too heavy for his Mom to carry to school, he hopped there (two miles) on one leg! Read this book to learn about more of the amazing accomplishments of this amazing young man. Reviewed by Lisa Colem What an inspirational person! This picture book biography of Emmanuel Ofosu Yeboah is nominated for the 2019 Monarch Award, an Illinois K-3 Readers Choice Award. Emmanuel was born with one leg that didn't work as it should, but that didn't stop him. In fact, it made him try even harder. After he became too heavy for his Mom to carry to school, he hopped there (two miles) on one leg! Read this book to learn about more of the amazing accomplishments of this amazing young man. Emmanuel was born in Ghana, West Africa, with a deformed leg. His father left the family but his mother continued to encourage Emmanuel to make something of himself. Emmanuel taught himself to crawl and hop, so he was able to hop the two miles to school and then hop all the way back home at the end of the day. At school kids would not play with him at first, so he saved up his money to buy a new soccer ball that he shared with the others as long as they let him play too. Soon he was playing socc Emmanuel was born in Ghana, West Africa, with a deformed leg. His father left the family but his mother continued to encourage Emmanuel to make something of himself. Emmanuel taught himself to crawl and hop, so he was able to hop the two miles to school and then hop all the way back home at the end of the day. At school kids would not play with him at first, so he saved up his money to buy a new soccer ball that he shared with the others as long as they let him play too. Soon he was playing soccer using crutches to get around. It was at school that Emmanuel also taught himself to ride a bike. Then his mother fell ill and Emmanuel had to leave school to support his family. He headed for the big city of Accra where he looked for a job. It took time, but he started working as a shoe shiner and for a restaurant that also gave him a place to stay. He sent money home and two years later returned home because his mother’s health was failing. After her death, he decided to follow his dream to bike around Ghana. He worked to get help with his dream, becoming a spokesperson in his country for people with disabilities. He completed his journey of 400 miles in just ten days, an amazing journey that proved that one person’s dreams could deeply change a culture. This is an inspiring story about a child who learned to cope with a disability in a place where there were very few resources available to him. The text succinctly explains that in Ghana many people thought that people with disabilities couldn't do anything or might even be cursed. Emmanuel went on to become an athlete and an advocate for people with disabilities, helping to make changes in Ghana that made life better for people with disabilities. Expressive art shows emotion throughout Emmanuel This is an inspiring story about a child who learned to cope with a disability in a place where there were very few resources available to him. The text succinctly explains that in Ghana many people thought that people with disabilities couldn't do anything or might even be cursed. Emmanuel went on to become an athlete and an advocate for people with disabilities, helping to make changes in Ghana that made life better for people with disabilities. Expressive art shows emotion throughout Emmanuel's journey. I just find Sean Quall's art very pleasing to the eye. The characters are highlighted in each spread, wearing bright colors that stand out against a mostly neutral background. An author's note explains that Emmanuel went on to compete in major athletic events and he carried the torch in the 2004 Cairo Olympics. His bike ride and continued activism contributed to laws passed in Ghana that guarantee people with disabilities the same rights as other people. Emmanuel's Dream is an inspirational story about a boy who refuses to be overcome by his disability. Others tell him he should just become a beggar, but he is determined to be the best he can be. The illustrations are absolutely beautiful, and the story flows well. Students will find hope and strength in Emmanuel's strong, resilient spirit. #bookaday What a wonderful true story of Emmanuel Ofosu Yeboah born with a disfigured leg in Ghana. At the time of his birth some people believed it was a curse. This is a story about perseverance and the belief that YOU can change the world. Eventually, his political activism helped to pass the Person's with Disabilities Act. Great story for growth mindset lesson, Genius Hour. Beautiful true story about one man who didn't give up, no matter the odds. Loved the text, loved the illustrations, loved the story--picture book trifecta. This is a true story about a boy named Emmanuel, who was born in a small village in Ghana, West Africa. Emmanuel was born with one healthy leg and one leg that did not work. Because of this, his father left and never came back. Emmanuel’s mother had faith in Emmanuel’s ability to do great things. She encouraged him to work hard to get everything he needed. So Emmanuel would hop around on one leg or use crutches. He was able to play soccer with his friends at school on crutches, and they taught him how to ride a bike as well. When Emmanuel’s mother becomes sick, Emmanuel leaves for the capitol of Accra to earn money for his family. At first he has trouble finding employment, as most people tell him to beg because he is disabled. Finally, he finds a job and works hard to send money back for two straight years. When his mother is deathly ill, Emmanuel comes home to see her one last time before he dies. Emmanuel feels that he needs to teach others that having a disability does not mean that a person can’t do anything, so he begins to ride around Ghana on a bicycle to spread awareness. He is incredibly successful, encouraging others with disabilities to come out and have faith in their abilities. Emmanuel becomes well-known across Ghana for his efforts. As my wife taught in the villages of Ghana and has told me many stories of the children there, this story had a very personal effect for me. Having a disability always presents some type of challenge, and in Ghana this challenge is almost always quite a hefty one. I am inspired by Emmanuel’s perseverance and strong work ethic, especially with only one working leg. Emmanuel’s story reminds me of my wife’s second year in Ghana, when she taught in the north. Sarah found a village where a large number of children were not allowed to go to school for various reasons. Most of these reasons had to do with some sort of disability, or the fact that they were female and expected to take care of their younger siblings instead of going to school. Believing that these children deserved an education too, Sarah worked with some like-minded people to build and open a school for any child, no matter what. Children were able to go to school no matter if they had one hand or two, and the girls could bring their baby siblings so they could learn while they played. These children soon learned the same lesson that Emmanuel championed for: disabilities or any sort of obstacles should not hold a person fully down or label them negatively! Sean Qualls illustrates this book using mixed media. His pictures have a collage-cartoon feel to them with round, smooth faces and simple black outlines for lips and noses. The illustrations do not include a plethora of extra details, but instead focus on what is most important to the story. The bold test is set right on top of the pictures, and the illustrations often wind around and in between the text. These pictures are not always fully in color; Qualls uses color and lack thereof powerfully in this book, once again helping the reader to focus in on the message of the story and the heart of the book. These pictures appeal to children with their cartoon-like feel and their simple, yet inviting appeal. After reading this book, students should engage in an open and honest discussion on disabilities and how people in today’s American society are treated with disabilities. What is set in place so that people with disabilities have the proper advocates? Is it enough? What is a disability, and what can a person do when he or she has one? Are disabilities limited to the physical? How can disabilities be obstacles, and how can society help individuals overcome these obstacles? After a thorough discussion, students should write a one-page reflection on their current stance on this important subject. This book is amazing! It gives a REAL LIFE example of children having to deal with struggles in their life. Emmanuel is a strong boy who can do more than even I! He loses his mother and is forced to take care of his entire family. He does this and more! Emmanuel is an inspiration for all. Even some adults couldn't do what Emmanuel did! I will have all of the children again sit down on the rug. I then will ask them this question “Who here knows what they would This book is amazing! It gives a REAL LIFE example of children having to deal with struggles in their life. Emmanuel is a strong boy who can do more than even I! He loses his mother and is forced to take care of his entire family. He does this and more! Emmanuel is an inspiration for all. Even some adults couldn't do what Emmanuel did! I will have all of the children again sit down on the rug. I then will ask them this question “Who here knows what they would do if their parents could not take care of them anymore?” I then would listen to their answers and continue on saying “This story, Emmanuel’s Dream by Laurie Ann Thompson and Sean Qualls talks about a boy and what he has to do since his mother passes away.” I then will then show them the cover. I will then say “Can anyone here tell me anything that they notice about this cover?” Hoping that someone will notice Emmanuel having only one leg. I will then say, “Do any of you think you could ride a bike with only one leg?” They will probably all giggle and I will try to make it more serious because this book has a good message. I want the children that I teach to be exposed to real life stories and I think this is a great example! I will then say, “This is a true story about a boy named Emmanuel who does just that.” I will then open the book to the first page about Emmanuel being born. “Do you guys think that Emmanuel can still do everything you do, with only one leg?” They will all give their answers and I will then finish saying “He absolutely can, let’s see how strong Emmanuel really is!” I will then continue reading the book. Rationale Portion: This book I start asking the kids what they would do without the assistance of their parents. I ask this because I want the kids to really be exposed to real things that happen to children all over the world. This book once they hear the story is a great example of the struggles Emmanuel overcomes. I then move on to the cover talking about the boy who is missing a leg. I tell them that he is missing a leg but he is still a strong boy and can do what everyone else can do. I think it is important to address that because throughout the story all of the children will notice the leg being missing. If they know that the leg is missing before it will cause less distraction during the story time. I finish my introduction talking about how Emmanuel is strong in the story and can accomplish everything for this family even only with one leg. Emmanuel's Dream is a beautifully written and illustrated picture book biography for K-5 students. This book can spark conversations in any elementary classroom about perseverance, especially because Emmanuel, the man the biography is written about, experienced triumph in more ways than one in his lifetime. This book is a WOW for me because of how the author details his life to us and makes Emmanuel out to be a true hero and a man of distinguish. The sacrifices he made for those he loved is honor Emmanuel's Dream is a beautifully written and illustrated picture book biography for K-5 students. This book can spark conversations in any elementary classroom about perseverance, especially because Emmanuel, the man the biography is written about, experienced triumph in more ways than one in his lifetime. Emmanuel's Dream by Laurie Ann Thompson is a remarkable bibliographical book about Emmanuel Ofosu Yeboah's life as he overcomes living life with a deformed leg. Emmanuel was born in Ghana, West Africa and raised by his mother. When Emmaneul's peers doubted his abilities with a deformed leg, his mother reminded him to follow his dreams. Emmanuel conquers many inspiring adventures as a child, and especially as a teenager and adult. Emmanuel's displays a powerful and is sure to encourage everyone t Emmanuel's Dream by Laurie Ann Thompson is a remarkable bibliographical book about Emmanuel Ofosu Yeboah's life as he overcomes living life with a deformed leg. Emmanuel was born in Ghana, West Africa and raised by his mother. When Emmaneul's peers doubted his abilities with a deformed leg, his mother reminded him to follow his dreams. Emmanuel conquers many inspiring adventures as a child, and especially as a teenager and adult. Emmanuel's displays a powerful and is sure to encourage everyone that reads this book. Emmanuel's Dream is best suited for students in grades 2-5. I consider Emmanuel's Dream by Laurie Ann Thompson to be a great book to incorporate in my classroom as a read-aloud. This book is a great example to use to teach about biographies. This book is also an excellent book to promote discussion about following your dreams and not giving up even when people discourage you. This book would be great to read aloud anytime during the school year, however, I do believe this would be a great book for the beginning of the year to encourage students. This is a biography about Emmanuel Ofosu Yeboah who is born in Ghana with only one leg. He pushed through his disability to follow his dream of biking around his country and succeeded. He inspired other people with disabilities along the way to go after their goals and dreams despite the prejudices of others. I would use this in the classroom as a way to teach about historical figures and teaching students that they can follow their dreams despite the difficulties they may face. Students need to This is a biography about Emmanuel Ofosu Yeboah who is born in Ghana with only one leg. He pushed through his disability to follow his dream of biking around his country and succeeded. He inspired other people with disabilities along the way to go after their goals and dreams despite the prejudices of others. I would use this in the classroom as a way to teach about historical figures and teaching students that they can follow their dreams despite the difficulties they may face. Students need to hear true, inspiring stories of others to show that they can do whatever they set their mind to since other people of the past have. This was a wow book for me because of the inspiring story of Emmanuel and the way the story was told in a way that an elementary schooler could follow and enjoy. Emmanuel's story is really inspiring, but unfortunately this book was too short to be more than a summary: 'he didn't accept that disabled people should be treated differently, so he cycled around the country'. I understand it is a picture book and they aren't very long, but I could definitely see myself being left hungry if I had read that as a kid. An inspiring story told in bright prose with charming illustrations. This should be in every library and on every household's bookshelf. This is such an inspirational book. This is so important for everyone to read. Monarch 2019 nominee. Very inspiring. Emmanuel not only thrives with his disability, but helps his family despite being young, and manages to make a difference to others. This book was such an inspiration. I wasn't familiar with the story of Emmanuel Ofosu Yeboah but what an inspiration to individuals with disabilities and without everywhere. I loved the part in the book where it said disability doesn't mean unable. This picture book was a beautiful portrayal of the life of Emmanuel and how one person can change the world. It was a book about perseverance and how we can change the perspectives of others and how they see disability. This trade book is a true story of Emmanuel Ofosu Yeboah. He biked across Ghana for about 400 miles, with one leg only. I really liked this book and the message the book gives to people out there who are scared to encounter people with disabilities and how they should treat them. I personally think this is a book to remind readers that people with disabilities are just like us.